On Memorial Day, I thought I'd take a few seconds to tell a few stories about guys who served in the Armed Forces. This is by no means a full and comprehensive list, and it is not meant to be a condemnation of athletes who don't serve or who protest military action. It's just a few stories I'd like to share about guys who served. The king of the Malapropism, Yogi Berra, before he played baseball, served on a boat that invaded Normandy on D-Day. Barely 18 years old, he volunteered for the Navy. In 1944, he was part of the invasion of Omaha Beach and was on a boat about 150 yards off the coast. The ships' job was to clear the way for the army transports, which meant it went in before a lot of the other ships in the invasion. Yogi and his boat were out in the water, under fire for twelve days. "I never brought it up. I never said that I was in the service, unless someone asked me," said Berra. "There are other things to think about." Rocky Bleier was best known for playing fullback for the Pittsburgh Steeler teams during the 70s. Drafted by the Pittsburgh Steelers in 1968, Bleier went to Vietnam to serve his country. While in country, Bleier was ambushed and was hit with grenade shrapnel in his right leg and rifle fire. He was told by doctors he would never play football again. While recuperating, he received a postcard from Steelers owner Art Rooney which read "Rock - the team's not doing well. We need you. Art Rooney." One year after being wounded, Bleier reported to Steelers training camp. He spent two full years trying to regain a spot on the active roster, and was even waived on two occasions. Eventually, an off-season training regimen brought Bleier back to 212 pounds in the summer of 1974. From that point on, he would be in the Steelers' starting lineup. 1974 was also the first year the Steelers won a Super Bowl. While many consider Ted Williams the greatest hitter who ever lived, most don't know he stats were impeded by 5 years of service he gave his country in WWII and in Korea. After volunteering for a flight training assignment, he served as a flight instructor for the Marines during WWII. In 1952, Williams, who was on inactive reserve duty for the Marines, and was 33, married and with a child, who called up for active duty. He was sent to Korea and flew 37 combat missions. 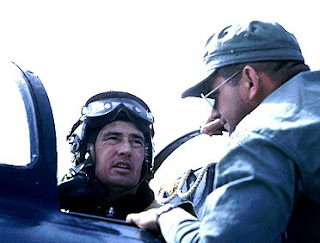 John Glenn, who was in the same squadron as Ted Williams, had this to say about Williams during one mission: "Once, he was on fire and had to belly land the plane back in," Glenn said. "He slid it in on the belly. It came up the runway about 1,500 feet before he was able to jump out and run off the wingtip. Another time he was hit in the wingtip tank when I was flying with him. So he was a very active combat pilot, and he was an excellent pilot and I give him a lot of credit." "Everybody tries to make a hero out of me over the Korean thing," Williams once said. "I was no hero. There were maybe 75 pilots in our two squadrons and 99 percent of them did a better job than I did. But I liked flying. It was the second-best thing that ever happened to me. If I hadn't had baseball to come back to, I might have gone on as a Marine pilot." On December 8th, 1941, Bob Feller who was an all-start pitcher and who had won the triple crown of pitchers in 1940, joined the Navy. he was the first major leaguer to volunteer for combat duty after Pearl Harbor. He was 23. He was gun crew chief on the U.S.S. Alabama for the duration of the war, which fought at Tarawa, Iwo Jima, and in the Marshall Islands. For his service, he earned five campaign ribbons and eight battle stars. "I'm very proud of my war record, just like my baseball record. I would never have been able to face anybody and talk about my baseball record if I hadn't spent time in the service." There's been a lot said about Pat Tillman. Some people thought he was a "G.I. Joe guy, who got what was coming to him." Others felt he was a hero who gave the ultimate sacrifice. Here are the facts. He was a seventh round draft pick who played his way into the Arizona Cardinal starting rotation. He earned $512,000 as a safety for the Arizona Cardinals in 2001. Then, motivated by the Sept. 11 terrorist attacks, he turned down a three-year, $3.6 million offer from the Cardinals to enlist in the Army. He was killed in action by friendly fire in Afghanistan on April 22, 2004. Despite the controversial way and subsequent investigations into Tillman's death, Pat's jersey is the top selling Cardinal jersey in their franchise and is consistently on the top jerseys sold in the NFL. Sometime today, between the ballgame and the B-B-Q and the third beer, remember those who sacrificed their time, money, loved ones and lives for their country.